As one of the most well-known luxury vehicle manufacturers in the world, BMW has made a place for itself in the hearts of drivers who appreciate high-performance innovation and technology that doesn’t skimp on class and elegance. When you’re ready to get behind the wheel of a brand-new BMW, Moss Motors BMW in Lafayette, LA, has you covered. We offer an extensive range of models at competitive prices that won’t break your budget. Whether you’re looking for the latest BMW 4 Series hatchback or a 2018 BMW X5 SUV, our knowledgeable team is available to make your buying experience as simple and stress-free as possible. Here at Moss Motors BMW, we offer convenient auto financing options to ensure you drive off our lot in the brand-new BMW you’ve been dreaming of. X1-X6 Sports Activity Vehicles—BMW’s X models feature ample space for comfort and utility that’s fused with a sleek design and the dynamic power you expect. Available in coupe and SAV styles. 2-8 Series—From smaller coupes and sedans to mid– and full-sized sedans, SUVs, and crossovers, BMW’s Series models offer comfort, style, and power, providing a range of options that are sure to meet your individual needs. M models—Designed to specs you’d expect on the track, BMW’s M models are high-performance versions of the numbered series, artfully engineered into aggressively powerful vehicles that make a stunning impression everywhere you go. BMWi—These electric-powered vehicles are well suited to eco-minded drivers who are searching for a powerful, long-lasting alternative to traditional gas-powered vehicles. They’re conscientiously engineered in emissions-free factories and feature materials made from renewable resources. No matter your style, you’re sure to find the car of your dreams at Moss Motors BMW. Moss Motors BMW has been helping drivers in and around Lafayette, LA, buy luxury, high-performance BMWs since 1980. Our staff is committed to providing unparalleled assistance that makes the buying process simple, efficient, and satisfying. We offer the convenience of an on-site service center for swift, professional maintenance and repair services, making us your one-stop shop for all things BMW. 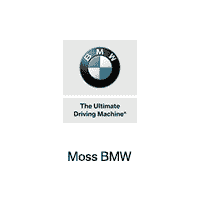 Schedule a test drive with us today and experience the Moss Motors BMW difference. Visit our showroom and test drive a new BMW today!